This morning, we're gushing over these adorable little lambs wandering around the idyllic rolling countryside of New Zealand. This beautiful setting is actually Hobbiton from the Lord of the Rings Trilogy which was shot on the Alexander Family Farm in Matamata. Bilbo and Frodo Baggins' home was buried in these hills but now the sheep have claimed them as their own, taking advantage of the underground earthen habitats. The set for Hobbiton was constructed in 1998 after director Peter Jackson found the Alexander Family farm in an aerial search of the North Island of New Zealand looking for the ideal charming little village. The rolling countryside and the vegetation closely resembled that of J.R.R Tolkein’s description of Middle Earth and so the site was adapted to become Hobbiton, including the creation of 37 little hobbit houses tucked into the hillside. Now only 17 of those hobbit houses remain, but you can take your own tour of the movie set and Alexander Farm. 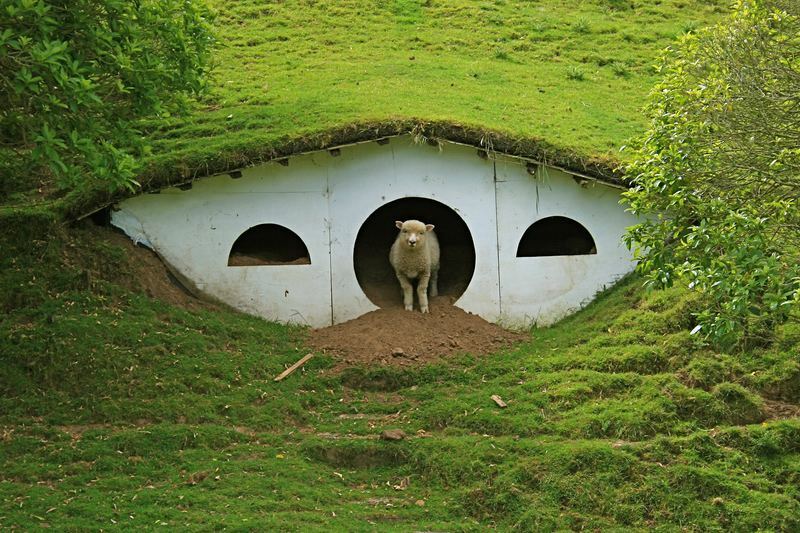 You can crawl into Bag End, although it looks nothing like it did in the movie and you can even pet the little lambs. The Hobbits had a deep connection with nature and farming and we dig their underground homes that stay cool in the summer and protected from the cold in the winter. We’re sure that’s exactly why the sheep have taken them over. I wish I were a sheep! Idyllic setting. It's better than the Sackville Bagginses living in Bag End, that's for sure. Great post. Almost iconic these days. This idyllic setting is located on the Alexander Family Farm, but many others know it by a different name - Hobbiton. The farm has been used for raising sheep and cows since 1978 and in 1998, it was chosen by Lord of the Rings director Peter Jackson as the site for Hobbiton. 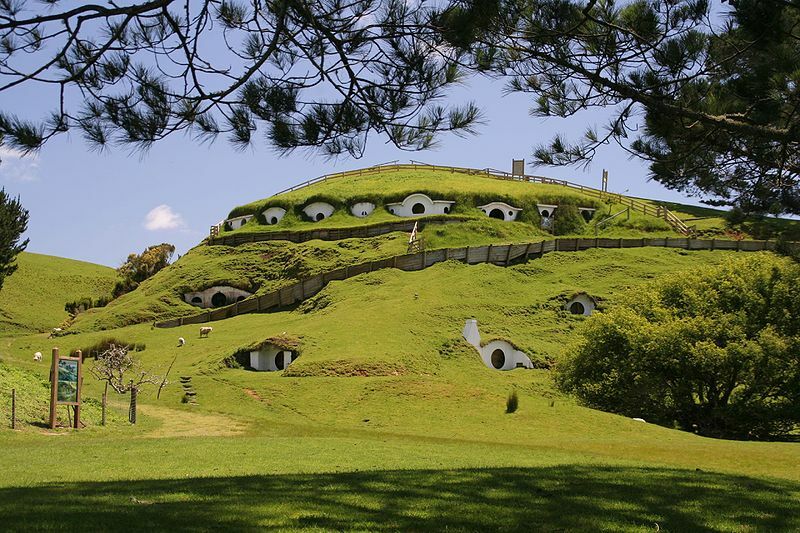 The farm was altered to include hobbit houses, which were underground homes, with facades sticking out of the hill. As they were only built for a movie, the homes are not very deep and the facades are really all there are to the "houses". Luckily, the shallow holes are cozy enough for sheep to take shelter in. Earthen and underground homes are incredibly energy efficient, staying cool in the summer and protected from the elements in the winter. In total thirty-seven hobbit holes were created with untreated timber, ply and polystyrene. The original hobbit holes remain, but the polystyrene facades have been removed. Visitors are welcome to check out the farm and movie set, where you can take tours of the area and have an educational and interactive sheep farm experience. Construction of Hobbiton took three months and filming commenced in December of 1999 and went on for another three months. One could actually learn a lot from the hobbits and their underground homes about green building and energy efficiency. This was the home of Bilbo and Frodo Baggins, also called Bag End. The farm has about 13,000 sheep and 300 Angus beef cattle and most of their income comes from mutton, beef and wool. The farm is run by three brothers and their father and the sheep are sheared every 8 months.